My Newest Project and Happy Holidays! You need to look closely to see the brown panel but it is there. I couldn't get the lighting right! I hope this long awaited blog post finds everyone happy, healthy, and enjoying family and friends. I’ve been working on a project but it has been a while in coming to you. Now that Christmas vacation is here I have a little time to sew. I’ll get right to it. Here was the inspiration. I just loved the look of this. I decided to start with a cream colored t-shirt that I already owned. 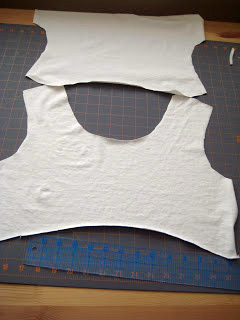 I just cut it off under the arms and reshaped the neckline. 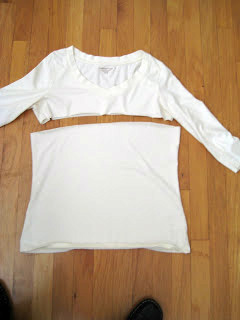 Then, I had to reset the sleeves to adjust the fit. Because the original shirt was a v-neck, the neckline had to be a little deeper than the picture. Here it is before I added the brown panel. It still is not totally fit or pressed here. Because I dropped the neckline, the panels will not be the exact same proportion as the picture, but it will give me the same feeling. I will accessorize and model it in a future post! I needed a creative fix and a diversion from cleaning and doing report cards. So, I searched through my closet and to my horror, one of my favorite t-shirts had a hole in the hem! NOOOOOO! 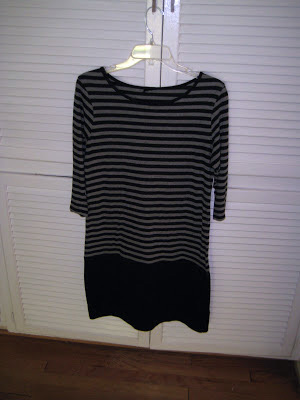 I was ready to throw it away when I realized I could just change it into a dress with the bottom of another t-shirt. I had a brand new black t-shirt that was from my son's baseball team and never worn. It did the trick nicely. 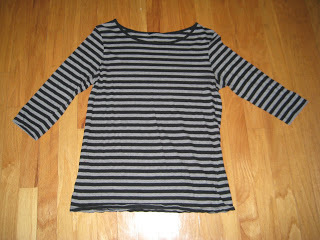 I just cut off the offending hem from the striped shirt, then added the bottom of the black t-shirt. I can wear it as a dress with black tights and stack heeled loafers for work, or with black leggings and ballet flats for casual. I feel women in their 50's can wear leggings providing the top totally covers the "behind." I wouldn't be caught dead with them otherwise! Simple fix and my favorite "T" has new life! I know! I know! It has been forever. However: 28 third graders, parent conferences, impending report cards, and mind blowing changes to the educational standards will do that to a blogger. 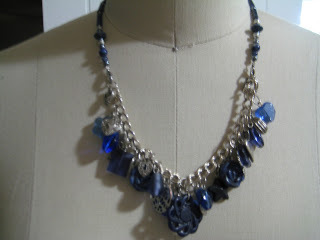 So now I do however have a little jewelry makeover to share. 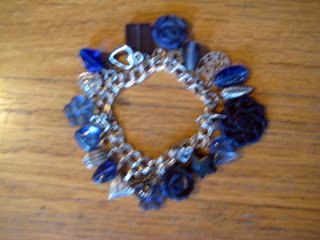 I originally made this as a charm bracelet. 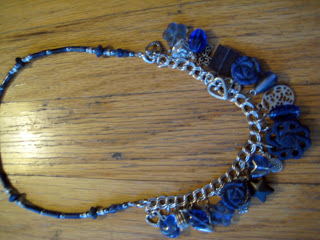 It turned out very cute, and coordinates with so many things in my wardrobe. The problem was that it is totally impractical for my work life. That dangling bracelet drove me nuts and would get in the way when I wrote on the whiteboard. Solution! Turn it into a necklace. 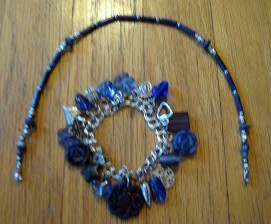 The beauty of it is that I engineered it to be able to come off of the necklace chain and still be able to use it as a charm bracelet as I wish. All I did was add lobster clasps on my necklace chain. What do you think?